The United States Constitution provides that “Congress shall have Power . . . To regulate Commerce . . . with the Indian Tribes.” It is no surprise that American Indian tribes are mentioned in our Constitution. Indian tribes have always played a major part in the non-Indian exploration, settlement, and development of this country. When Christopher Columbus thought he had discovered the “New World” in 1492, it is estimated that 10-30 million native people lived in North America, that is, in the present day countries of Mexico, United States and Canada. These millions of people lived under governments of varying sophistication and complexity. These native governments were viable and fully operational political bodies which controlled their citizens and their territories and were an important factor in the development of the United States government we live under today. The European countries that colonized North America dealt with the native tribal governments as sovereign governments, that is, as governments that had independent and supreme authority over their citizens and territories. Especially in the area of the present day United States, the European powers interacted with American Indian tribal governments through official diplomatic means. Starting with England as early as 1620, and France, Spain, and Holland, the European powers negotiated with Indian tribes through official government to government council sessions and by entering treaties which recognized tribal governmental control over the territory of this “New World.” The European countries had a selfish motive for dealing with American Indian tribes in this fashion. The European governments wanted to legitimize the transactions they entered with Indian tribes to buy tribal lands. Thus, they wanted to make the transactions look official and legal by buying Indian lands through governmental treaties so that other European countries could not contest or object to these land sales. When the thirteen American colonies decided to rebel against England and seek their independence, they formed the Continental Congress to manage their national affairs. This Congress operated from 1774-1781 and dealt with Indian tribes on a diplomatic, political basis and signed one treaty with the Delaware Tribe in 1778. The political interest of the United States at that time was to keep the tribes happy with the new American government and to keep Indian tribes from fighting for the English in the American Revolutionary War during 1775-1781. This Congress engaged in diplomatic relations with tribes by sending representatives to the tribes bearing many gifts and promises of peace and friendship to keep the tribes neutral in the United States’ war with England. The thirteen American colonies then adopted the Articles of Confederation in 1781 and convened in a new Congress to manage their affairs on the national level. This Congress also had to manage Indian affairs and keep the tribes from fighting against the United States. The new Congress also sent diplomatic representatives to the tribes and promised friendship and peace, and ultimately it signed eight treaties with Indian tribes between 1781-1789, including treaties with the Iroquois Confederacy, the Cherokee Tribe, the Shawnee Tribe and numerous other tribes. However, this Congress’ power in Indian affairs was limited because the Articles of Confederation did not clearly give this Congress the exclusive power to deal with tribes. 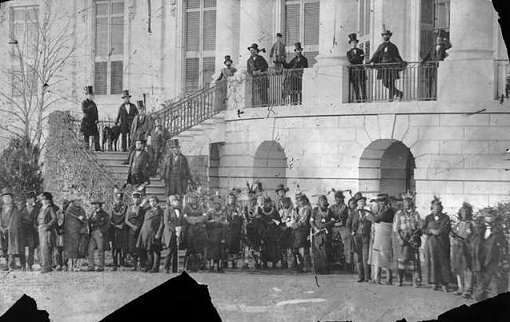 Thus, various states meddled in Indian affairs and actually caused wars between tribes and Georgia and South Carolina, for example, because the states were trying to steal Indian lands. The problems caused by states getting involved in Indian affairs led many people to call for the formation of a new and stronger United States government wherein the exclusive power over Indian affairs would be placed only in the hands of the national government and would be taken completely away from the states. When the representatives of the thirteen colonies/states started drafting the United States Constitution, to form the United States government we now live under, the “Founding Fathers” of this nation had to carefully consider the role of Indian tribes in the political arrangement of the new nation. As James Madison pointed out, much of the trouble that England and the thirteen colonies had suffered with Indian tribes from the 1640’s forward arose when individual colonists or colonial governments tried to greedily take Indian lands. In those instances, the colonies and individual colonists would negotiate with tribes without the permission or the involvement of the English King or the American national leadership. The drafters of the U.S. Constitution tried to solve this problem by taking Indian affairs out of the hands of the colonies/states and individuals and placing the sole power to deal and negotiate with tribes into the hands of the U.S. Congress. Thus, Indian tribes and their people, and the United States relationship with tribes are addressed in the U.S. Constitution. In Article I, the United States Constitution accomplishes the goal of excluding states and individuals from Indian affairs by stating that only Congress has the power “To regulate Commerce with foreign Nations, and among the several States, and with the Indian Tribes . . . .” The United States Supreme Court has interpreted this language to mean that the Congress was granted the exclusive right and power to regulate trade and affairs with the Indian tribes. The very first United States Congress formed under our new Constitution, in 1789-1791, immediately assumed this power and in the first five weeks of its existence it enacted four statutes concerning Indian affairs. In 1789, the new Congress, for example, established a Department of War with responsibility over Indian affairs, set aside money to negotiate Indian treaties, and appointed federal commissioners to negotiate treaties with tribes. In July 1790, this Congress passed a law which forbids states and individuals from dealing with tribes and from buying Indian lands. This law is still in effect today. Indian tribes are also referred to, but are not expressly designated, in Article VI of the Constitution where it is made clear that all treaties entered by the United States “shall be the supreme Law of the Land.” In 1789, the United States had only entered a few treaties with European countries while it had already entered nine treaties with different Indian tribes. Consequently, this treaty provision of the U.S. Constitution states that the federal government’s treaties with Indian tribes are the supreme law of the United States. Individual Indians are also mentioned in the Constitution of 1789, Article I, and again in the Fourteenth Amendment to the Constitution which was ratified in 1868. In counting the population of the states to determine how many representatives a state can have in Congress, Indians were expressly not to be counted unless they paid taxes. In effect, Indians were not considered to be federal or state citizens unless they paid taxes. After the Civil War when citizenship rights were extended through the Fourteenth Amendment to ex-slaves and to “[a]ll persons born or naturalized in the United States,” that Amendment still excluded individual Indians from citizenship rights and excluded them from being counted towards figuring congressional representation unless they paid taxes. This demonstrates that Congress still considered Indians to be citizens of other sovereign governments even in 1868 when the Fourteenth Amendment was adopted. This view was correct because most Indians did not become United States citizens until 1924 when Congress passed a law making all Indians United States citizens. For many years after 1924, states were still uncertain whether Indians were also citizens of the state where they lived and in many states Indians were not allowed to vote in state elections. American Indian tribes have played a major role in the development and history of the United States and have engaged in official, diplomatic governmental relations with other sovereign governments from the first moment Europeans stepped foot on this continent. Indian tribes have been a part of the day to day political life of the United States and continue to have an important role in American life down to this day. Tribes continue to have a government to government relationship with the United States and they continue to be sovereign governments with primary control over their citizens and their territory. It is no surprise, then, that the relationship between Indian people, tribal governments and the United States is addressed in the provisions of the United States Constitution. From 1492 forward, European countries and the United States justified their dealings with the natives and American Indian tribes in North and South America under the “doctrine of discovery.” Under this principle, the European country that first discovered a new area where Christian Europeans had not yet arrived could claim the territory for their own country. This did not mean that the natives lost the right to live on the land or to farm and hunt animals on it but it did mean that the natives could only sell their land to the one European country that “discovered” them and that they should only deal politically with that one European country. In most situations, the Europeans also enforced the doctrine of discovery against themselves because they recognized and agreed to be bound by the principle that the discovering country earned a protectible property right in newly discovered territories. The audacity of one country “discovering” and claiming lands already occupied and owned by American Indians came from the idea that Christians and white Europeans were superior to people of other races and religions. When European countries first came to the New World, they were not strong enough militarily to just take the land from the Indian tribes. Thus, they entered treaties with tribes to make the transactions look legal and valid, and they bought the lands they wanted. In addition, influential scholars in England and Spain, for example, believed that Indians had a legal right as free people to continue to own their lands and that a European country could only take lands by force in an honorable war. In exercising its control over the American continent, the United States also enforced the doctrine of discovery. Thus, as the United States Supreme Court stated in 1823, in the case of Johnson v. McIntosh, 21 U.S. (8 Wheat) 543 (1823), the United States acquired the sole right to buy lands from Indian tribal governments under the doctrine of discovery. Thus, sales of land that Indians had made to persons other than to the United States government were invalid. Tribes continued to have the right to use and occupy their lands but their governmental sovereign powers were restricted in that they could only sell their lands to the United States. Johnson, 21 U.S. at 573-74. The United States gained this power under the doctrine of discovery from England and from other European countries as the U.S. bought or acquired the “discovery” authority of these European countries over various parts of the American continent. In upholding this power of discovery over Indian tribes for the United States, the Supreme Court had to ignore its own opinion that Indians possessed natural rights to their lands. In fact, the Supreme Court refused to say why American farmers, “merchants and manufacturers have a right, on abstract principles, to expel hunters from the territory they possess” or to limit the tribal rights. Instead, in determining tribal rights to sell their lands, the Court relied on the doctrine of discovery and the fact that the United States had beaten some tribes in war to decide that only the United States could buy Indian lands. “Conquest gives a title [to the land] which the Courts of the conqueror cannot deny . . . .” Id. at 588. Robert J. Miller is an Associate Professor at Lewis & Clark Law School in Portland. He is the Chief Justice of the Court of Appeals of the Confederated Tribes of the Grand Ronde Community of Oregon and sits as a judge for other tribes. 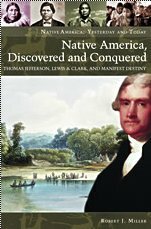 He is the author of Native America, Discovered and Conquered: Thomas Jefferson, Lewis & Clark, and Manifest Destiny.